One of the most common and challenging tasks for any application involves persisting and reading information to and from a database. Although the Symfony Framework doesn't integrate any component to work with databases, it provides tight integration with a third-party library called Doctrine. Doctrine's sole goal is to give you powerful tools to make database interactions easy and flexible. In this chapter, you'll learn how to start leveraging Doctrine in your Symfony projects to give you rich database interactions. Doctrine is totally decoupled from Symfony and using it is optional. This chapter is all about the Doctrine ORM, which aims to let you map objects to a relational database (such as MySQL, PostgreSQL or Microsoft SQL). If you prefer to use raw database queries, this is easy, and explained in the "How to Use Doctrine DBAL" article. You can also persist data to MongoDB using Doctrine ODM library. For more information, read the "DoctrineMongoDBBundle" documentation. The easiest way to understand how Doctrine works is to see it in action. In this section, you'll configure your database, create a Product object, persist it to the database and fetch it back out. By separating the database information into a separate file, you can easily keep different versions of the file on each server. You can also easily store database configuration (or any sensitive information) outside of your project, like inside your Apache configuration, for example. For more information, see How to Set external Parameters in the Service Container. There's no way to configure these defaults inside Doctrine, as it tries to be as agnostic as possible in terms of environment configuration. One way to solve this problem is to configure server-level defaults. The class - often called an "entity", meaning a basic class that holds data - is simple and helps fulfill the business requirement of needing products in your application. This class can't be persisted to a database yet - it's just a simple PHP class. Doctrine allows you to work with databases in a much more interesting way than just fetching rows of scalar data into an array. Instead, Doctrine allows you to fetch entire objects out of the database, and to persist entire objects to the database. For Doctrine to be able to do this, you must map your database tables to specific PHP classes, and the columns on those tables must be mapped to specific properties on their corresponding PHP classes. A bundle can accept only one metadata definition format. For example, it's not possible to mix YAML metadata definitions with annotated PHP entity class definitions. The table name is optional and if omitted, will be determined automatically based on the name of the entity class. Doctrine allows you to choose from a wide variety of different field types, each with their own options. For information on the available field types, see the Doctrine Field Types Reference section. You can also check out Doctrine's Basic Mapping Documentation for all details about mapping information. If you use annotations, you'll need to prepend all annotations with ORM\ (e.g. ORM\Column(...)), which is not shown in Doctrine's documentation. You'll also need to include the use Doctrine\ORM\Mapping as ORM; statement, which imports the ORM annotations prefix. Be careful if the names of your entity classes (or their properties) are also reserved SQL keywords like GROUP or USER. For example, if your entity's class name is Group, then, by default, the corresponding table name would be group. This will cause an SQL error in some database engines. See Doctrine's Reserved SQL keywords documentation for details on how to properly escape these names. Alternatively, if you're free to choose your database schema, simply map to a different table name or column name. See Doctrine's Creating Classes for the Database and Property Mapping documentation. When using another library or program (e.g. Doxygen) that uses annotations, you should place the @IgnoreAnnotation annotation on the class to indicate which annotations Symfony should ignore. Even though Doctrine now knows how to persist a Product object to the database, the class itself isn't really useful yet. Since Product is just a regular PHP class with private properties, you need to create public getter and setter methods (e.g. getName(), setName($name)) in order to access its properties in the rest of your application's code. Add these methods manually or with your own IDE. Actually, this command is incredibly powerful. It compares what your database should look like (based on the mapping information of your entities) with how it actually looks, and executes the SQL statements needed to update the database schema to where it should be. In other words, if you add a new property with mapping metadata to Product and run this command, it will execute the "ALTER TABLE" statement needed to add that new column to the existing product table. An even better way to take advantage of this functionality is via migrations, which allow you to generate these SQL statements and store them in migration classes that can be run systematically on your production server in order to update and track changes to your database schema safely and reliably. Whether or not you take advantage of migrations, the doctrine:schema:update command should only be used during development. It should not be used in a production environment. Your database now has a fully-functional product table with columns that match the metadata you've specified. If you're following along with this example, you'll need to create a route that points to this action to see it work. This article shows working with Doctrine from within a controller by using the getDoctrine() method of the controller. This method is a shortcut to get the doctrine service. You can work with Doctrine anywhere else by injecting that service in the service. See Service Container for more on creating your own services. lines 10-13 In this section, you instantiate and work with the $product object like any other normal PHP object. line 15 This line fetches Doctrine's entity manager object, which is responsible for the process of persisting objects to, and fetching objects from, the database. line 18 The persist($product) call tells Doctrine to "manage" the $product object. This does not cause a query to be made to the database. line 21 When the flush() method is called, Doctrine looks through all of the objects that it's managing to see if they need to be persisted to the database. In this example, the $product object's data doesn't exist in the database, so the entity manager executes an INSERT query, creating a new row in the product table. In fact, since Doctrine is aware of all your managed entities, when you call the flush() method, it calculates an overall changeset and executes the queries in the correct order. It utilizes cached prepared statement to slightly improve the performance. For example, if you persist a total of 100 Product objects and then subsequently call flush(), Doctrine will execute 100 INSERT queries using a single prepared statement object. If the flush() call fails, a Doctrine\ORM\ORMException exception is thrown. See Transactions and Concurrency. Whether creating or updating objects, the workflow is always the same. In the next section, you'll see how Doctrine is smart enough to automatically issue an UPDATE query if the entity already exists in the database. Doctrine provides a library that allows you to programmatically load testing data into your project (i.e. "fixture data"). For information, see the "DoctrineFixturesBundle" documentation. You can achieve the equivalent of this without writing any code by using the @ParamConverter shortcut. See the FrameworkExtraBundle documentation for more details. You can also use AppBundle:Product syntax. This string is a shortcut you can use anywhere in Doctrine instead of the full class name of the entity (i.e. AppBundle\Entity\Product). As long as your entity lives under the Entity namespace of your bundle, this will work. Of course, you can also issue complex queries, which you'll learn more about in the Querying for Objects section. If the number of database queries is too high, the icon will turn yellow to indicate that something may not be correct. 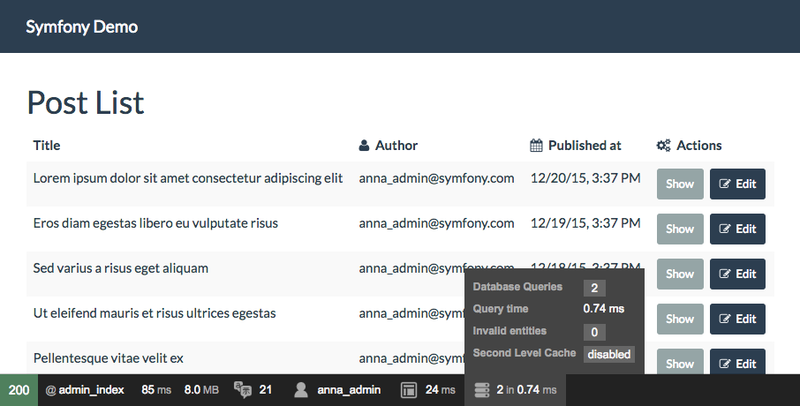 Click on the icon to open the Symfony Profiler and see the exact queries that were executed. calling flush() on the entity manager. Notice that calling $entityManager->persist($product) isn't necessary. Recall that this method simply tells Doctrine to manage or "watch" the $product object. In this case, since you fetched the $product object from Doctrine, it's already managed. As you might expect, the remove() method notifies Doctrine that you'd like to remove the given object from the database. The actual DELETE query, however, isn't actually executed until the flush() method is called. Of course, Doctrine also allows you to write more complex queries using the Doctrine Query Language (DQL). DQL is similar to SQL except that you should imagine that you're querying for one or more objects of an entity class (e.g. Product) instead of querying for rows on a table (e.g. product). When querying in Doctrine, you have two main options: writing pure DQL queries or using Doctrine's Query Builder. If you're comfortable with SQL, then DQL should feel very natural. The biggest difference is that you need to think in terms of selecting PHP objects, instead of rows in a database. For this reason, you select from the AppBundle:Product entity (an optional shortcut for the AppBundle\Entity\Product class) and then alias it as p.
Take note of the setParameter() method. When working with Doctrine, it's always a good idea to set any external values as "placeholders" (:price in the example above) as it prevents SQL injection attacks. The DQL syntax is incredibly powerful, allowing you to easily join between entities (the topic of relations will be covered later), group, etc. For more information, see the official Doctrine Query Language documentation. // and aliases it to "p"
The QueryBuilder object contains every method necessary to build your query. By calling the getQuery() method, the query builder returns a normal Query object, which can be used to get the result of the query. For more information on Doctrine's Query Builder, consult Doctrine's Query Builder documentation. All the queries in the previous sections were written directly in your controller. But for organization, Doctrine provides special repository classes that allow you to keep all your query logic in one, central place. see How to Create custom Repository Classes for info. Doctrine is highly configurable, though you probably won't ever need to worry about most of its options. To find out more about configuring Doctrine, see the Doctrine section of the config reference. Doctrine comes with numerous field types available. Each of these maps a PHP data type to a specific column type in whatever database you're using. For each field type, the Column can be configured further, setting the length, nullable behavior, name and other options. To see a list of all available types and more information, see Doctrine's Mapping Types documentation. Doctrine provides all the functionality you need to manage database relationships (also known as associations). For info, see How to Work with Doctrine Associations / Relations. With Doctrine, you can focus on your objects and how they're used in your application and worry about database persistence second. This is because Doctrine allows you to use any PHP object to hold your data and relies on mapping metadata information to map an object's data to a particular database table. Doctrine has a lot more complex features to learn, like relationships, complex queries, and event listeners. How to use Doctrine Extensions: Timestampable, Sluggable, Translatable, etc.